I noticed something about Filipino “national heroes”. None of the ones that the nation’s “thought leaders” wax poetic about most frequently are soldiers. As I wrote a while back, most of them died with their back turned towards their assailants. They captured no territory nor held a stronghold to the death. They are hailed as “martyrs”, but are martyrs actual heroes in the real sense of the word? Thus, Filipinos’ most revered historical characters are mere martyrs — people who died. Absent from the Philippines’ nationalist rhetoric, however, is a strong martial tradition. Year in and year out, top Filipino influencers “debate” what a “national hero” is, whether the Filipino is “still worth dying for”, and, most laughable of all, whether or not there still are any “real heroes” today. All the while they overlook real Filipino heroes — their fighting men and women who, as a matter of routine, are either on the battlefield or in a constant state of readiness to run towards the enemy with the intent to kill them. 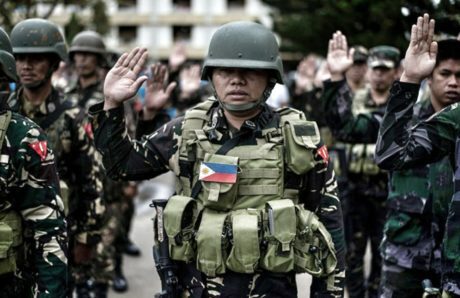 Indeed, the latter question — the question of whether or not there still are any real hereos today — is absolutely the most insulting to the Filipino soldier. The Filipino soldier, after all, is resolved to fight unconditionally and act on orders of his or her superiors all of whom owe absolute allegiance to the state. They are real heroes not just in action but in thought and in their entire way of life. To ask whether heroes still exist disrespects the Filipino soldier at a profound level. This is not to say Filipino soldiers are, at all, concerned about what characters a bunch of iPad-tapping snowflakes populate their quaint poltical narratives with. Recognised or unrecognised, they do what they see as their duty to do. Nonetheless, it is still worth noting how this lack of attention to real fighters mirrors the sort of society the Philippines is. Seen under that harsh light, it is easy to understand why Filipinos have allowed their nation’s ability to defend its sovereign interests with force has fallen to the dismal and deeply-embarrassing levels we see today. It is because their “thought leaders” would rather celebrate martyrdom (simply dying of a bullet in the back) than real heroism. Dying while fighting is, perhaps, the minimum standard of real heroism. But at the apex of the pile are heroes who fight and win. What is disturbing about the Philippines’ historical narrative is a lack of standout historical characters that fall within that spectrum that defines real heroism. Justifying being a mediocre nation, after all, is easy. Just re-purpose martyrs into “heroes” and spin a seductive narrative around them that appeals to a people who, for much of their history, had been hard-pressed to identify true national achievements of consequence. What exactly did Ninoy Aquino do? What do you expect from a culture that equates accent with slang? What do you expect from a culture whose “professional” sports writers uses the word “”dugout” in an indoor context? One of the most quoted sentences from the 2009-2010 election campaign was “use the force Noy”. As if Ninoy was Obi Wan Jedi master who when struck down by Darth Vader and became ” more powerful than you can ever imagine”. Well somebody forgot to Luke , Noynoy since the Force could not muster the creation of one law or one signature moment in his time in Congress and the Senate. The teachable moment of Noynoy being president is have the right name, and have your mom die at the right time. No need to do anything with your life. Even in the private sector. Just keep leveling up in Call of Duty. Instant president with all these fans who will justify your ignorance and incompetence. Filipinos have nothing to expect from their “rich” culture. In every tourism advertisement all over the world each of their culture are described as “rich”. WHAT FILIPINOS SHOULD NOT EXPECT ANYTHING FROM is from their Philippine Fake News from their Fake Journalists who are only good in written English but not in spoken English. Philippine News is more about gossips and suggestive innuendoes. Their OP-EDs are all about science. Yes, Pedro, SCIENCE. Fake News columnists are addicted to SCIENCE. We, foreigners, call it POLITICAL SCIENCE. They are hired wired in politics. Their attorney columnists cannot even turn in a column that is legally logical and when they do it is full of latin. LATIN, like, prima facie, dom perignon, does not make their column believable, well, it may be believable to Filipinos but not believable to us. In the U.S. our columnists do not use latin in writing about constitution and justice ONLY IN THE PHILIPPINES. Right on the mark. Want to be in politics? Just be an Aquino or look like an Aquino. Never mind that youve accomplished nothing. At least be allied with the Yellowtards. The PCOS will take care of the rest. If our country is a military ruled state like one from Myanmar or some of the Latin American countries like Chile, Argentina, Peru, Honduras, etc. during the heydays of the Cold War then we’ll finally know now who’s the REAL heroes in the Philippines. It is none other than our soldiers, our navies, our coast guards & our air forces in the AFP and not the OFWs or Team Gilas Pilipinas or a Fil-Am singer who’d won a contest from a reality show in the US. They are ready to sacrifice our country for the sake of sovereignty, security, bravery, patriotism, self-sacrifice, self-discipline, nation-building & love and respect of our country. This should be a moral lesson to all of us! I am scared of Filipinos with guns. To Filipinos intelligence imminate from the barrel of the gun. Filipinos also love to pull triggers. I often heard Filipino says when they lost argument: “NALAKIHAN SA KATAWAN ISASAMPAKIN KITA”. Ninoy Aquino, Jr. is neither a hero, nor a martyr. He is a political opportunist who died for his own cause. He is the founder/supporter and the arms supplier of the New Peoples’ Army. JoMa Sison and Bernabe Buscayno alias Kumander Dante are his buddies. If you look deep inside yourself, you are the real hero. Surviving life itself in your journey of life is heroism. Don’t look for others, look into yourself. With regards to martyrdom, this requires a higher calling. Dr. Jose Rizal, is the true martyr. He gave his life , in order to awaken his fellow Filipinos. Ninoy Aquino, Jr. was assassinated. Up to now, we don’t know who ordered it; who did it and why they murdered him. I have a unfounded belief, that his being a supporter of the NPA and his being on the political limelight, could be a cause of him to be a good target for assassination. The opposition, including their foreign backers need a cause to remove the late Pres. Marcos. Murdering Ninoy Aquino, Jr. and blaming it on Marcos is an excellent issue. So, the rest is history. Up to now, we don’t know who murdered Ninoy Aquino, Jr. and why he was murdered. His death is a good issue, to hold to, for the Aquino Cojuangco political agenda ! Ninoy Aquino was never a hero. He was close to Marcos Family. Imelda visited Niinoy and told him, “… there are people we cannot control do not go home.” HE DID ! Knowing he will never be murdered. They did. Nope, SOMEONE DID. With the fake-intelligence of Filipino CIS and SOCO even with the help of FBI nobody knew who pulled the trigger. Because they were conveniently dead. How come Ninoy became a hero when he had so many slave workers in his Hacienda? Filipinos back then wanted to be slaves to the Aquinos? Ninoy Aquino was an ACCIDENTAL HERO. He did not meant to be. Remember he flew away. He exiled himself. GET REAL FILIPINOS. GET REAL! We beg to differ. So watch out your shitposting lest we end up like trollfags. Like I said, look who’s talking. You’re the one who is shitposting here; the same guy who love to impersonate other users in this site. is the phrase ‘pilipinos are worth dying for’ means ‘pilipinos deserved to die’? and heroes are natural, and martyrs are man made lakes. There are uncounted 350,000 Filipinos who are TnT !!! Filipinos would rather scram than die for their fellow Filipinos. Filipino crooks stash their loot in the U.S. There are PMA “Generals”. Senators and their families. They do not want to die for Filipinos. They want to rob Filipinos. There are no Filipino heroes. Jose Rizal was picked by Americans. Thankfully, the Filipinos have spoken. It is not Jose Rizal their national hero. IT IS MANNY PACQUIAO !!! They so love Manny Pacquiao because Manny Pacquiao is the only best thing that ever happened to Filipinos. 1. That I would, and any of my associates who desired to go with me, be free to live in any foreign country. Having fixed upon Hong Kong as my place of residence, it was agreed that payment of the indemnity of $800,000 (Mexican) should be made in three installments, namely, $400,000 when ALL THE ARMS in Biak-na-bató were delivered to the Spanish authorities; $200,000 when the arms surrendered amounted to eight hundred stand; the final payment to be made when one thousand stand of arms shall have been handed over to the authorities and the Te Deum sung in the Cathedral in Manila as thanksgiving for the restoration of peace. The latter part of February was fixed as the limit of time wherein the surrender of arms should be completed. Fake General Aguinaldo was not smart. He is caught with his lies just recently! Many thank yous to internet. When Aguinaldo was caught selling the Filipinos to Spain according to some fake U.P. historians they changed their stories. The revised story was Aguinaldo, in exchange of money, was to buy firearms in Hong Kong and replaced the ones that were surrendered under the pact. Sick! Crazy! Aguinaldo and U.P. Historians were caught in their lies. Again. They changed their story. I forgot what the final story was. It is obviously NOT LOGICAL to surrender the firearms took the money and run to Hong Kong and buy firearms that they surrendered. And you know what? Filipinos took it as truth! Logically it does not make sense. Strategically it is funny. Logistically it is weird. The real reason of Pact of Biak na Bato? So Aguinaldo can retire in luxury over the blood of Filipinos. The Mexican gold coins payment was entrusted to Hen. Antonio Luna; who further entrusted to his mistress: Ysidra Cojuangco. The Mexican gold coins disappeared from the face of the Planet Earth, until now. It reappeared in kind, as the Hacienda Luisita of Tarlac. Aguinaldo is in the same way, as former COMELEC chief, Andres Bautista. This crook is now enjoying his loot and living a life of luxury in the U.S. Imagine having a multi billion pesos, multiple foreign and local bank accounts. Just do a HOCUS PCOS in your SMARTMATIC, And then : a billion pesos richer . Who could beat that instant wealth scheme ? The Katipunan Mexican gold coins were looted from the Mayas, by the conquering Spaniards, and is still an “unsolved mystery” up to now. It was like the DAP, PDAF, typhoon Yolanda fund of the beginning of the century. I like mystery stories ! Thank you, Hayden! The Filipinos need to ask the inutile Senate in cahoots with U.P. “professors” masters of none and his story and their story to look into this so the Filipinos can be nationalistic and patriotic. Where did the Mexican Gold coins went? Was this why Yamashita conquered Philippines for the Gold of it? Lookit U.P. historians, STOP FOOLING THE FILIPINOS !!! They may be foools but they are not stupid. Well, sometimes they are depending on the phase of the moon. The Mexican Aztec Empire, was huge before the coming of the Spanish conquerors. It almost consist of half of the South American region. The Aztec Empire was rich in gold and silver. When the Spanish conquerors came. They looted most of the gold and silver; and shipped them to Spain. The Spanish Empire was shipping gold and silver stolen from their colonies in the Americas, thru Spanish Galleons. Came the British who produced the Pirates of the Carribeans, to hijack these Spanish Galleons, loaded with gold and silver. The British Empire grew from Piracy of Spanish Galleons. Until they defeated the Spanish Armada, and became the “Mistress of the Sea”. The gold necklace paid to the idiotic Filipino Chief, to sell the Panay Island was looted from the Aztecs. The Spanish conquerors have the tendency to buy their way , out of the colonizing problems with their looted gold. Until now, we all remain naive and stupid on the eyes of foreigners and on the eyes of corrupt Filipino politicians ! Any Pilipinos who holds a gun think he is Fernando Poe Jr. or Rambo, their “hero”. When Pilipinos holds a gun there is only one thing in their mind, “magsiga-siga” and bully to submission everyone on the street. Pilipinos are ignorant of the responsibility on how to use a gun. According to psychologists and student of Freud gun is an extension of their small short incapable manhood. When they have gun they think they are macho. They got it wrong! Macho means demon in bed. But they cannot be demon in bed if they have useless manhood as big as Ilocano chorizo. So, they whip out their gun and prove their virility. Reading all of the above, there were never Filipino soldier heroes. There were toy soldiers. They were not heroes. They preferred Boxer Manny Pacquiao … NOW THAT IS WHAT THEY CALL THEIR HERO. It’s possible that the Americans ingrained pacifist “heroes” in the historical literature to ensure the natives remain submissive. One cannot deny that our conquerors were all well versed in the art of war and conquest and on how to deal with individuals who spread ideas deemed “inconvenient” for the powers-that-be. Studying history teaches one a lot of things, like how others succeeded where others have failed. In military during the 1800s, it is simply impossible to win when you need to steal the weapons you need from your enemies to be able to stand a chance. Maybe the Filipinos back then should have waited instead and let the US run us until it became too costly for them. Eventually we would have a government that would lobby for independence like how Singapore’s Lim Yew Hock did. Military soldiers are not heroes, they’re just gun-personify, a tool of war that can be use by any fascistic military-oriented leader, some people like it until they turn and use against them. The military once threaten to become irrelevant will show its true ugly head. Employment in the military is EMPLOYMENT OF LAST RESORT !!! UNSKILLED? NO ENGLISH? UNEMPLOYED? UNEMPLOYABLE? GO PHILIPPINE MILITARY YOUNG MAN !!! The list of potential positions for unemployable layabouts is actually quite long. The Philippine State is one of the most bloated in the world; if you can’t even get a government-funded job of some sort, you must be an utter loser. Where once we aspired to be more like our heroes, today we try to make our heroes more like us.